The format now switches as South Africa and Pakistan will now battle in a 5-ODI series. The St George’s Park, Port Elizabeth, on Saturday, will host the first ODI. After clean sweeping the visitors in the longest format, the confidence of the hosts would be sky-high. On the other hand, Pakistan would hope for change in fortunes with the change in format. Keep reading to find out South Africa vs Pakistan 1st ODI Match Prediction. Pakistan has had a torrid time in international cricket of late. They were defeated in UAE by New Zealand and then South Africa in Tests. Their last ODI series was drawn 1-1 against New Zealand. The morale of the dressing room might not be at the best currently. But they would be hoping to resurrect that sooner as the World Cup inches closer. South Africa, on the other hand, have enjoyed a great run, especially in ODI cricket. The Proteas defeated Sri Lanka and Australia in their own backyard in the 50-over format. But at home, in their last ODI series, India had given them a 5-1 hammering. But there’s a marked difference in Indian and Pakistani ODI outfits at the moment. 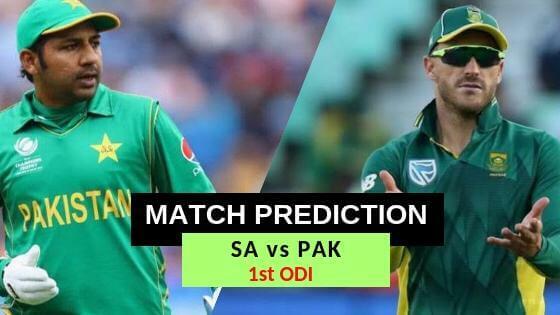 South Africa vs Pakistan 1st ODI Match Prediction: With the change in format, there will be changes in the faces in either side. While the Proteas are aware of the conditions, the Pakistanis might take their time to settle in. Hence, South Africa will start favorites in the opening encounter.